A number of traffic disruptions have been reported around the city as yet another major rainstorm hits the GTA. The on ramp from Dundas Street to the northbound Don Valley Parkway is once again closed due to flooding after briefly reopening this afternoon. Major ponding has also been reported on Lake Shore Boulevard at Rees Street and at Remembrance Drive and Toronto Police say they are dealing with a hydro pole that was split in two by lightning at Highfield Road north of Dundas Street East. 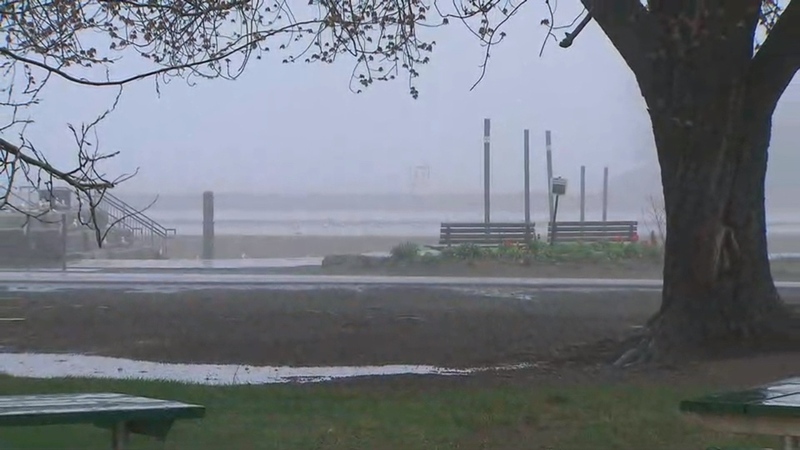 The flooding comes amid a severe thunderstorm warning for Toronto and the GTA. Environment Canada warns that the region could receive 30 to 50 millimetres of rain by later this evening. “A cluster of heavy thunderstorms will move through Toronto early this evening producing torrential downpours. Rainfall amounts of 30 to 50 mm may be possible in a short period of time,” the warning says. The storms have also caused power outages in some area. At around 6 p.m., Alectra said that 1,338 homes and businesses were without power in the Steeles Avenue and Main Street South area in Brampton. This is the third time in the last two weeks that Toronto has been hit by a significant rainstorm. On Aug. 7, some parts of the city received up to 100 millimetres of rain, resulting in flash flooding. Then last Friday another round of torrential rain in the city brought about flooding at Union Station, sending commuters scrambling during the height of the afternoon rush hour. According to a city spokesperson, staff have since taken proactive steps to prevent repeat flooding occurrences at the downtown transit station, including repairs to a track drain in a pedestrian pathway. Additional city staff have also been deployed to Union Station today to immediately respond to any flooding occurrences, the spokesperson said. Metrolinx spokesperson Anne Marie Aikins tells CP24 that crews will be monitoring flood prone areas today, such as the Richmond Hill line corridor and Union Station. She said that extra Metrolinx staff will also be on hand at Union Station throughout the day. The rain began to fall in downtown Toronto just prior to 7 a.m. on Tuesday and is expected to continue intermittently until midnight. Due to the rain, CAA says that it is expecting a higher than normal call volume though it says that delays for service calls are not expected to be significant. A high of 25 C is expected for today.